"What to the Slave, is the Fourth of July?" and work strikes, set to begin on July 8th. the united states, set to begin in just six days. scope – it is necessary to look back two years, to 2011. Days of Solidarity With the Struggle to End Prison Torture! Phone: (503) 893-2914. Read more. 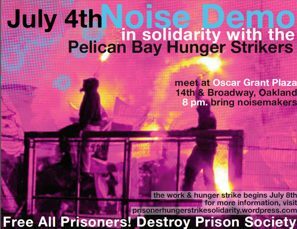 Pelican Bay State Prison (look for Stop Mass Incarceration banner). 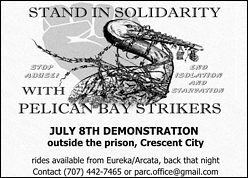 Crescent City: demonstration outside Pelican Bay State Prison. meet-up locations, and other information. 1pm – 2pm @ Bancroft and Telegraph, Berkeley, CA (map). Chehalis Prisoner Strikes; noon @ King County Jail (5th and James). Ottawa, Ontario, Canada: Letter writing to hunger striking prisoners at Pelican Bay; 7pm @ 67 Cartier. for people everywhere to take action this day to bring attention to the prisoners' demands and struggle. march to Corcoran State Prison where our demands will be heard! 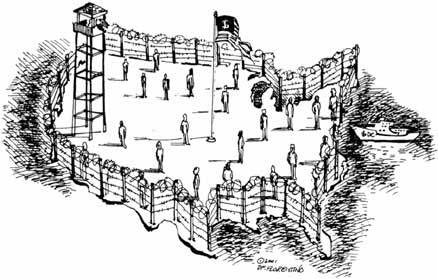 Contact rachel@criticalresistance.org or 510-444-0484. Read more.